Forgot My Fitbit app prevents you from losing and forgetting your Fitbit. Helps you get your Fitbit back on your wrist in seconds. WHAT OUR USERS ARE SAYING ------------------------------------------------- "This app is a life saver. It's very easy to leave your house without my Fitbit Alta. The notifications I get right before I leave the house are the best. I hate losing Fitbit step challenges because I forget to wear my Fitbit." - Mlouuuuuuuu "Mornings are crazy at my house and I can't count the number of times I've left for work with my Fitbit still on the nightstand. This app has already helped me out several times by reminding me that I've left it behind before I've gotten out of the driveway." - wojo123 ------------------------------------------------- Fitbit's can fall off your wrist without you knowing and forgetting to wear your Fitbit before leaving your house or work is very common. Forgot My Fitbit can help solve these problems by tracking your Fitbit's location and notifying you to wear your Fitbit in case you forgot to put it back on. The app works with the following Fitbits - Fitbit Alta, Blaze, Charge, Charge HR, Charge 2, Flex 2, Surge, Versa. The app doesn't not work with a Fitbit Flex, One, or Zip. Sorry. :( HOW DOES IT WORK 1. Launch the app on your iPhone and select your Fitbit. 2. When the app cannot "see" your Fitbit it sends a notification that your Fitbit is missing. 3. 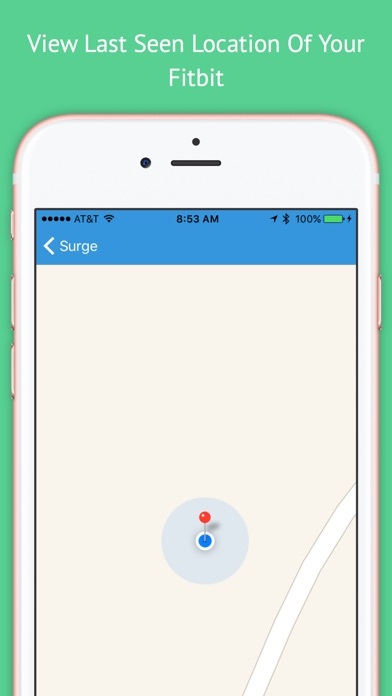 Use the map in the app to see the last know location of your Fitbit. Or use the notification as a reminder to put your Fitbit back on your wrist. Couple things to remember - - The app MUST run in the background. Our tests have shown that our app only uses 1% of your battery per day!! - The app MUST be launched again if you restart your iPhone. Pretty simple. **************************************************** Send all issues with the app and any suggestions to support@bickster.com or visit www.bickster.com/support. Please do not post issues or problems with the app as reviews. We cannot help you or improve the product when comments are posted as App Review. We look forward to hearing from you. Thank you. **************************************************** HOW DO I KNOW IT'S WORKING First, follow the instructions located in the app. Then place your Fitbit on the Kitchen table and go for a walk with your iPhone. When a notification appears on your Lock or Home screen with the message, "Did you forget your Fitbit?" it's working. "IF YOU TAKE A STEP WITHOUT YOUR FITBIT DID YOU EVEN MOVE?" "FORGOT MY FITBIT AT HOME. All THAT WALKING I DID TODAY, COMPLETELY WASTED" "I FOTGOT MY FITBIT. THAT WHOLE WORKOUT DIDN'T EVEN COUNT." 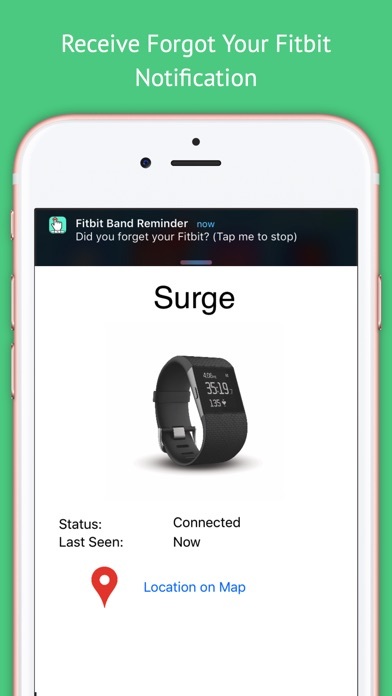 FEATURES - Notifies you when your phone is out of range of your Fitbit. - View the last know location of your Fitbit on a GPS enabled map. 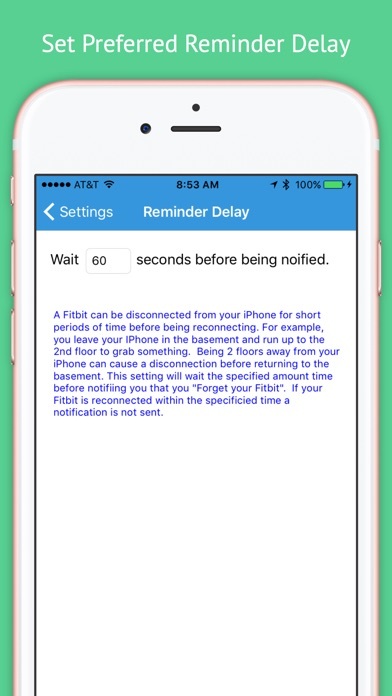 - Set preferred reminder delay time for false positive avoidance. Please read the instructions in the app for how to setup your Fitbit to work with the app. Please Note: Continued use of GPS running in the background can decrease battery life. Our tests have shown that our app only uses 1% of your battery while running in the background.